Rhododendron ‘Grandiflorum’ is a cultivar created from the catawba rhododendron species, which is native to the United States. This reliable evergreen with stunning, showy blooms is a highly valued member of a large family of hybrids and cultivars developed for garden use. Rhododendron ‘Grandiflorum’ is hardy down to -29C, which is quite impressive. Large glossy leaves will remain on your hedge throughout the year, accompanied by equally large rose-purple bell-shaped flowers in May-June. Rhododendron catawbiense ‘Grandiflorum’ has an annual growth rate of approximately 20-30cm and can grow 2-3m tall. This relatively vigorous cultivar should be allocated a position in partial shade for best results. Full sun and deep shade are not beneficial. 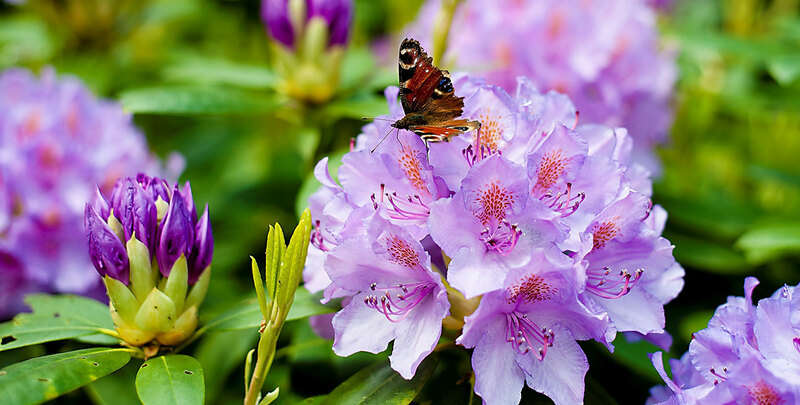 In addition, exposed sites with strong winds should be avoided as rhododendrons can suffer from exposure to wind. This highly ornamental large-leaved shrub prefers humus-rich, acidic soil that drains well. Rhododendron catawbiense ‘Grandiflorum’ does not tolerate deep planting, as it can easily dry out or drown due to its shallow roots. Spent flowers should be removed after flowering to ensure new growth. Pruning can be done as desired, although it is not required. In case you wish to reduce this shrub’s size, remember to schedule maintenance trimming immediately after flowering.